Foreo issa toothbrush Brand New in cased box. The waterproof handle is electrically safe and is designed for use in the bathroom. Plug the charging unit into an electrical outlet and place the toothbrush handle on the charging unit. Every 30 sec the toothbrush interrupts in order to let you know that you have to change the mouth quadrant. 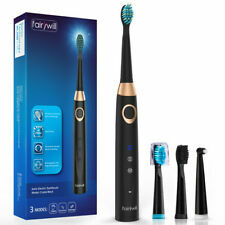 (Fairywill Electric Toothbrush-FW 508 Black. 1 x Fairywill Electric Toothbrush. Fairywill electric toothbrush help you smile confidently:). 3 Modes and 3 Brush Heads. Clean, Sensitive, Massage. Just choose the one that fits your teeth. 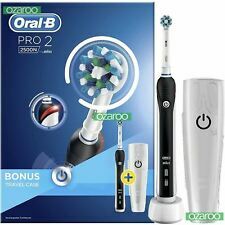 1 x Oral-B Pro 2 2500N Black Handle. MPN: PRO 2 2500N. 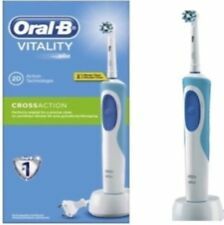 The Oral-B PRO 2 electric toothbrush features the professionally inspired CrossAction toothbrush head. The round head is specially designed for a tooth by-tooth clean, and its CrissCross bristles are set at a 16 degree angle to reach deep between teeth to lift and power away up to 100% more plaque for a superior clean vs. a regular manual toothbrush. Includes bonus tube of Oral-B 3D White toothpaste. 1 x Oral-B 3d White toothpaste. 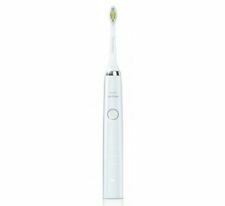 Fairywill Electric Toothbrush-An Easy and More Effective Way to Brush,Why Not Have a Try?. The Fairywill 507 electric toothbrush has 40,000 micro-brush per minute. Remove up to 100% more plaques and stains, compared with a regular manual toothbrush. Switch to Sonicare. It provides superior cleaning between the teeth and removes significantly more plaque of a manual toothbrush. Removes up to 100% more spots for whiter teeth in just 1 week. It can also be used to rinse your mouth after brushing. The black/pink Oral-B Pro 650 electric toothbrush provides a clinically proven superior clean vs. a regular manual toothbrush. The professionally inspired design of the Cross Action toothbrush head surrounds each tooth with bristles angled at 16 degrees, and 3D cleaning action oscillates, rotates, and pulsates to break up and remove up to 100% more plaque than a regular manual toothbrush. 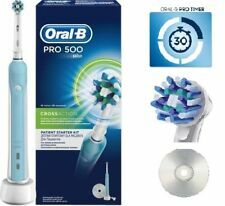 Enjoy having a healthy smile with this Oral-B Pro 650 Black Electric Toothbrush and Toothpaste Set. The Oral-B 650 Toothbrush features a dentist-inspired round brush head, to surround each tooth for better cleaning. The switch from a manual toothbrush made easy. The uniquely angled neck of this toothbrush head makes it easier to reach back teeth, removing plaque in those hard-to-reach areas. Removes up to 2 x more plaque than a manual toothbrush. The Oral-B Vitality electric toothbrush provides a clinically proven superior clean vs. a regular manual toothbrush. The round shape of the Precision Clean toothbrush head is designed to clean tooth by tooth, and 2D cleaning action oscillates and rotates for better plaque removal than a regular manual toothbrush. 1 x Oral-B CrossAction Brush Head. MPN: D12.513 3757 CrossAction. The Oral-B Vitality electric toothbrush provides a clinically proven clean vs. a regular manual toothbrush. The professionally inspired design of the Cross Action toothbrush head surrounds each tooth with bristles angled at 16 degrees and 2D cleaning action oscillates and rotates for better plaque removal than a regular manual toothbrush. The Oral-B Vitality electric toothbrush provides a clinically proven better cleaning vs. a regular manual toothbrush. The round shape of the White Clean toothbrush head is designed to clean tooth by tooth and 2D cleaning action oscillates and rotates for better plaque removal than a regular manual toothbrush. The Oral-B PRO 2500 electric toothbrush features the professionally inspired CrossAction toothbrush head. The round head is specially designed for a tooth by-tooth clean, and its CrissCross bristles are set at a 16 degree angle to reach deep between teeth to lift and power away up to 100% more plaque for a superior clean vs. a regular manual toothbrush. It is therefore the strongest fragrance available and being the strongest, lasts the longest, and one obviously has to use less of the product. Depending on skin type one could expect the fragrance to last up to 6 hours. 1 x Oral-B CrossAction brush head. The cross action toothbrush head surrounds each tooth with bristles angled at 16 Degrees and 2D cleaning action oscillates and rotates for plaque removal than a regular manual toothbrush. EFFECTIVE SONICARE TECHNOLOGY FOR DEEP YET GENTLE CLEANING YOU WILL SEE AND FEEL. SONICARE EXPERIENCE. ESSENTIAL FOR ANY DAILY DENTAL ORAL CLEANING. EASY START GENTLY INCREASES POWER OVER FIRST 14 USES TO EASE INTO THE. Includes bonus tube of Oral-B Pro Expert toothpaste. 1 x Oral-B Pro-Expert deep clean toothpaste. Sonicare electric toothbrush's unique dynamic action gently and effectively reaches deep between teeth and along the gumline. Easy-start program to acclimate to the Sonicare experience. Removes up to 2x more plaque than a manual toothbrush. 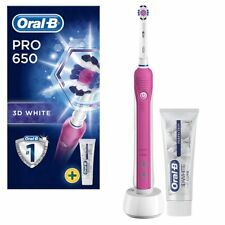 BRAUN ORAL B PRO 650 BLACK ELECTRIC TOOTHBRUSH 3D ACTION WHITE TOOTHPASTE. 1x Deep Clean Toothpaste 75ml. The Oral-B 650 Toothbrush features a dentist-inspired round brush head, to surround each tooth for better cleaning. 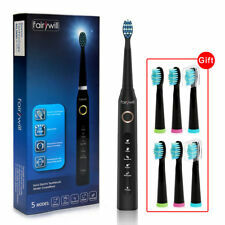 Fairywill Electric Toothbrush, Better choice for taking care of your teeth, why not give it a try?. The electric toothbrush is fully washable but don't soak it into water. Compared with a manual toothbrush. The Oral-B PRO 2 2500N electric toothbrush provides a clinically proven superior clean vs. a regular manual toothbrush. The professionally inspired design of the CrossAction toothbrush head surrounds each tooth with bristles angled at 16 degrees, and 3D cleaning action oscillates, rotates, and pulsates to break up and remove up to 100% more plaque than a regular manual toothbrush. The Oral-B Vitality electric toothbrush provides a clinically proven clean vs. a regular manual toothbrush. The professionally inspired design of the Cross Action toothbrush head surrounds each tooth with bristles angled at 16 degrees and 2D cleaning action oscillates and rotates for better plaque removal than a regular manual toothbrush. Automatic making foam, teeth cleaning, u-shaped silicone toothbrush head, without using yourself hands. 1PC Automatic Electric Toothbrush. 4 Working modes. Gender: adults. 4 Working modes: strong cleaning, massage, beautiful teeth, comfort mode. The CrossAction removes up to 100% more plaque than a regular manual toothbrush. The design of the Oral-B CrossAction toothbrush head features precisely angled bristles that are designed for optimal tooth coverage. 5 MODES OF WHITE, CLEAN, SENSITIVE, POLISH, MASSAGE to suit different conditions of teeth and gums. 55 gram extra-light weight designed, less than half of regular electric toothbrush. Light in hand but thorough cleaning with reduced noise, upgraded brushing experience than a regular electric toothbrush. Coffee Stain?. Sensitive Gums?. Inter-dental stains?These are not the problems.Because Fairywill Electric Toothbrush 508 provides 5 different strong modes. To fit in your gums and teeth, you can choose the appropriate mode while brushing your teeth. Many people press too hard when they brush, but how do you know if you are brushing too hard?. Oral-B Pro 3 3000 Electric Toothbrush protects your gums with automatic speed reduction, which alerts you and slows down the brushing speed if you brush too hard. Achieve a clinically proven superior clean vs. a regular manual toothbrush and whiter smile with the Oral-B Pro 650 3DWhite electric toothbrush and with the 3DWhite Luxe Glamourous Shine toothpaste. 1 x 3DWhite Luxe Glamourous Shine Toothpaste 75ml. The sleek white handle of the 5000 electric toothbrush improves your brushing habits. With the Smart Coaching you get from Oral-B Smart 5, 5000 toothbrush, you will improve your brushing habits and your oral health. Oscillates and rotates to remove up to twice as much plaque as a manual toothbrush. Preferred by dentists, electric toothbrushes are designed to increase teeth cleaning power, thanks to their brushing action, that is usually considered superior to a manual toothbrush. Electric toothbrushes are rechargeable devices, designed to be long lasting and make thorough teeth cleaning easier. Here on eBay, you can find a range of electric toothbrushes from leading brands including Oral B, Panasonic and Philips Sonicare. Studies suggests that electric toothbrushes are better at removing plaque than manual brushes. This is mainly due to the fact electric toothbrushes offer a range of motion, such as oscillation and pulsation, which gives a deeper clean and is harder to replicate manually. As electric toothbrushes produce a range of motions, it makes them easier to use compared to completing the teeth cleaning actions manually. Using an electric toothbrush, you can find the right cleaning action that works for your mouth and all you have to do is guide the toothbrush along your teeth. Depending on your requirements, you can find electric toothbrushes that come with a docking station and are charged by the mains or are battery operated. You may find some electric toothbrushes come with a travel charger for further convenience. You can find electric toothbrushes with a wide range of features to help improve your oral health. One of the key features to look out for is a toothbrush with a timer. This will ensure you are brushing your teeth for the correct length of time. Certain electronic toothbrushes have a reminder setting which tells you when it is time to replace your brush head for improved oral health. You can also find electric toothbrushes with a sensor to help monitor the pressure applied to your teeth when brushing to help prevent damage. Other toothbrushes, have a tongue scraper to keep your whole mouth clean.